The Women’s Fund of the Greater Cincinnati Foundation is a non-profit dedicated to making sure women in the Cincinnati region can be self-sufficient. They help women with everything from child care and employment to education and living wages by conducting research, investing in projects, giving grants and scholarships, and providing opportunities for women to make a difference in their community or workplace. The Women’s Fund’s “A Conversation With…” is an annual fundraising event that brings an inspiring and accomplished female to Cincinnati to share her story—successes and failures—with other women in an intimate setting. This year, they brought in Dr. Mae Jemison: Stanford University graduate, Peace Corps medical officer, and NASA astronaut. She was the first African-American woman in space! A total legend. Obviously, the setup needed to be as cool as Dr. Jemison is. The Women’s Fund wanted a cool, sleek set that was inspired by space (duh). The problem was, their previous sponsor wasn’t available and the organization, as a non-profit, did not have the budget necessary to match their vision. Fortunately, producer Janet Hill linked them with Tether, and we had a solution. The Fund had been working with another agency, in addition to Tether, to supply their set. The agency was getting them seating and a coffee table, leaving us in charge of finding a rug, accessories, and a big photo to use for decor. We decided to send the event details (date, budget, design criteria, etc.) to stylists in the Tether Directory, because that’s exactly what it’s for. The stylists created Pinterest boards with their vision for the set, and the team at the Women’s Fund chose the one that best aligned with their vision of “sleek, modern, ‘space-esque’, vibrant, and fun but sophisticated.” They were impressed—so much so that they decided to supply their set through us alone. Specifically, Yvonne Ballard’s ideas were right on the nose. Yvonne is an expert in styling and interior design, and she frequently works with clients such as Value City. Learn more about Yvonne and her company in the Tether Directory. Tether founder Tamia Stinson set out to discuss details with Yvonne: What pieces needed to be pulled, delivery options, cost estimates, contact sheets showing options. Communication between everyone involved in setting up the event had to be clear and efficient. 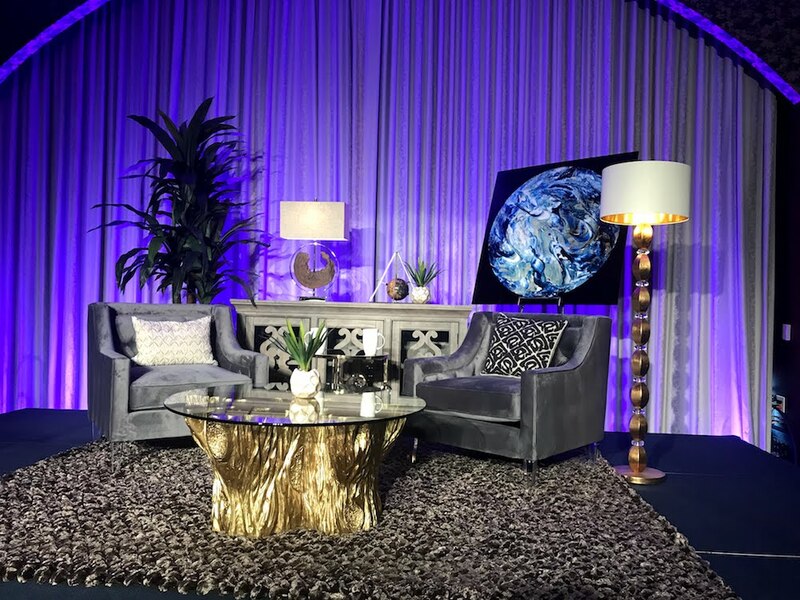 After going over initial details, Yvonne and Tamia discussed exactly which pieces of furniture were needed based on previous sets for previous “A Conversation With…” events. Tamia broke it down: each set generally included two seats or a couch (for interviewer and interviewee), a coffee table, a plant to liven the space up, a lamp, a photo, and a table with a large image or photo. After brainstorming and sending pictures of possible pieces back and forth, Tamia and Yvonne met with The Women’s Fund to discuss the available items, and work out the logistics of delivery, setup, teardown, etc. Thanks to Yvonne’s Value City connections, we were even able to get sponsored furniture and accessories for the event—a huge help for The Women’s Fund given their budget! After roughly two weeks of planning, it was showtime. The day of the event, Yvonne and Tamia worked with the Cintas Center’s venue manager to direct the load-in and set up the stage to make it look space-esque and spectacular. The final set design for the event. Note the "space nuggets" rug! The head of The Women’s Fund was extremely pleased with the set—she even considered buying a few pieces (a bonus for Value City)! Our contact at The Women’s Fund looked great and, of course, we felt great that she felt great. Even the attendees were inspired by Yvonne's work, and people took pictures of the stage throughout the event. All in all, the Tether team provided a set that was comfortable, modern, and totally galactic—plus it looked great in photos and videos. Dr. Jemison talks space travel and life advice. Truly inspiring. By sourcing creative talent via Tether, our client got a timely and affordable solution they absolutely loved. Contact us so we can do the same for you!